Would Hillary Clinton ‘reset’ relations with Russia? Hillary Clinton, frontrunner for the U.S. Democratic presidential nomination, has made waves in media this week by saying engagement is the best option when it comes to confronting Russian President Vladimir Putin. The promising overture coincided with the Russian leader’s conciliatory message to his U.S. counterpart Barack Obama to mark U.S. Independence Day on July 4, in which Putin called for dialogue built on “equality and respect.” Could this be taken as a faint signal that both sides would be prepared to consider a new “reset” in order to extricate bilateral relations from the hole they are currently in? The sanguine interpretation of Hillary Clinton’s comments seems to be misplaced. Her words should not be taken out of context. In fact, the former First Lady tacitly pointed out the danger of the U.S. getting involved in direct confrontation with Russia were Ukraine a NATO member. No wonder dyed-in-the-wool Russian optimists rejoiced on hearing about “constant engagement,” but is this any more than just wishful thinking? The cautious approach is supported by Washington’s recently-unveiled 2015 National Military Strategy, which lists Russia and China as the largest security threats for the United States. 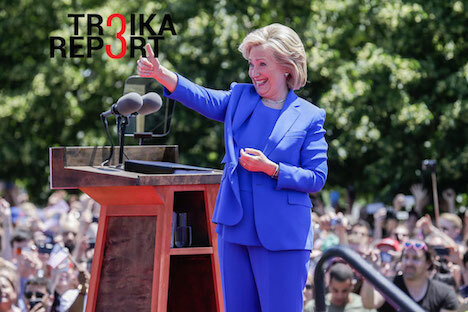 “I do not think it is a question of whether or not Hillary Clinton becomes the next U.S. president, but it is relevant to the long-term political agenda of Russian-American relations. The issue is whether our American partners would be ready to re-establish relations aimed at the normalization of dialogue on security issues, but also on economic ties, trade and investment. — Could Clinton’s surprisingly balanced statement reveal a growing understanding that the cost of disengaging with Russia is rising and that the alternative still looks to be the better option? “The agenda of bilateral relations is not limited to the Ukrainian crisis. Unlike the U.S., the Ukrainian issue is much more sensitive for Russia. For the United States it is vital to cooperate with Russia on such issues as the Iranian nuclear program, North Korea, fighting international terrorism, e.g. ISIS, dealing with the upheavals in the Middle East, and in Afghanistan, in the next two to five years. “From my perspective, Hillary Clinton’s statement was not a major shift in America’s foreign policy or in her own views. On the contrary, her statement reflects a growing consensus within the American establishment, both Democratic and Republican, which was recently reflected in the updated U.S. National Military Strategy. Clinton’s statement is very much in line with the spirit of this strategy, which will be in force well beyond the presidential elections. In essence, the American approach is a combination of its opposition to what it calls Russia’s ‘aggressive policies in the neighborhood’ and its actions, which are not in line with international law. In all probability, that is exactly what Vladimir Putin had in mind when sending his telegram to Obama, emphasizing that “Russia and the United States are able to find solutions to the most complex international problems and effectively counter global threats and challenges.” However, it will be difficult to overcome the “consensus” in the U.S. political class to which Igor Zevelev refers, that Russia’s actions are seen by the United States as a global concern. BRICS: A credible rival to the G7 at last? Russia is set to benefit from the BRICS summit in its heartland city of Ufa not only in economic and political terms but also in the context of the ongoing confrontation with the West. Yet, the elevation of the loosely-modeled alliance to international prominence is conditional on the ability of Brazil, Russia, India, China and South Africa to add substance to style and part with the image of a non-Western VIP golf club. Aware of this structural drawback, the five nations have earlier agreed to use the Ufa summit to apply the finishing touches to a $100-billion contingency currency reserve pool, from which each member state can draw in case of financial trouble, and breathe life into the New Development Bank. What’s more, the BRICS group is testing the water to reform trading between the member states by switching to local currencies. Should these reform plans take off, it would signal the insulation of the group from the current over-dependence on the U.S. dollar, as well as on the standards and procedures of the Western-dominated financial system. Yet despite the fact that these developments within BRICS can be seen as a challenge to the “Washington consensus” and promote a multipolar world agenda, Western media have paid relatively little attention to the Ufa summit. “I would not say BRICS is an ‘alternative’ in every respect. The main idea which originally united these countries was the desire to reform the system of global governance. This is an idea that everyone accepts, although there are areas of disagreement, or at least differences. The members of BRICS differ in terms of their internal political structures, social ideals and policies, etc. There is no Western-type ideological unity. It is a pragmatic union of several big countries handling some specific issues. — Was it a symbolic gesture to hold both summits in the city of Ufa? The challenges for and sustainability of the BRICS organization were discussed on the eve of the summit by experts brought together by the Inside Story program on the Al Jazeera English TV channel, featuring Andrew Leung, a UK-based foreign policy specialist and China analyst, Aly-Khan Satchu, a Nairobi-based emerging markets specialist and CEO of Rich Management, and Vladimir Mikheev, representing Troika Report. The discourse, in particular, touched upon the potential of the BRICS grouping to expand its outreach on the financial side. Despite relevant doubts raised by Mr. Satchu about the level of sophistication required by the alliance’s New Development Bank, as well as its predetermined focus on domestic demands and not on acting as a global lender, there is no denying that there is an appeal in the BRICS’ emerging model of equitable and fair distribution of loans and credits. Troika Report’s forecast that in the future New Development Bank loans with no political strings attached would be favored by emerging markets was shared by Mr. Leung. All in all, despite justified reservations about the degree to which the five countries have shared national interests, the BRICS summit in Ufa provides evidence that the emergence of a multipolar world is not a theoretical phantom. Fourteen years after its foundation, the Shanghai Cooperation Organization (SCO) is holding a benchmark summit in the central Russian city of Ufa, paving the way for an expansion that is qualitative as well as quantitative. The SCO has agreed to incorporate two major powers, India and Pakistan, which provides Russia with additional leverage in pursuing its pivot to Asia. Originally, the SCO had a limited agenda. It was envisaged simply as a pillar of stability and security for Central Asia aimed at countering threats posed by radical Islam and drug trafficking from neighboring Afghanistan. Now, it is slowly expanding and acquiring a different status. Before bringing on board new members, the SCO covered an area of over 20 million square miles, or about three fifths of Eurasia, inhabited by around 1.5 billion people (a quarter of the world's total). “India and Pakistan applied for full membership in the SCO some time ago... I think it is a positive sign and a step forward because the organization, while not at a dead end, is undecided on where to go next. The entry of India and Pakistan, especially India, will give an impetus to economic cooperation within the SCO, which is not its strongest point for the moment. India is a strong economic power with interests in Central Asia and growing trade with China. However, it will take time and effort to establish a harmonious multilateral dialogue between two nations that have not yet shaken off the grievances of the past. Further delay in admitting Iran, which holds observer status, to the club as a full-fledged member may have cast a slight shadow on the ascension of the SCO to prominence but has not dissuaded other aspiring neophytes. Egypt, among others, has applied for dialogue partner status, currently enjoyed by Belarus, Turkey and Sri Lanka.